The food trucks and fresh produce stands gathered outside the Indiana State Library today. 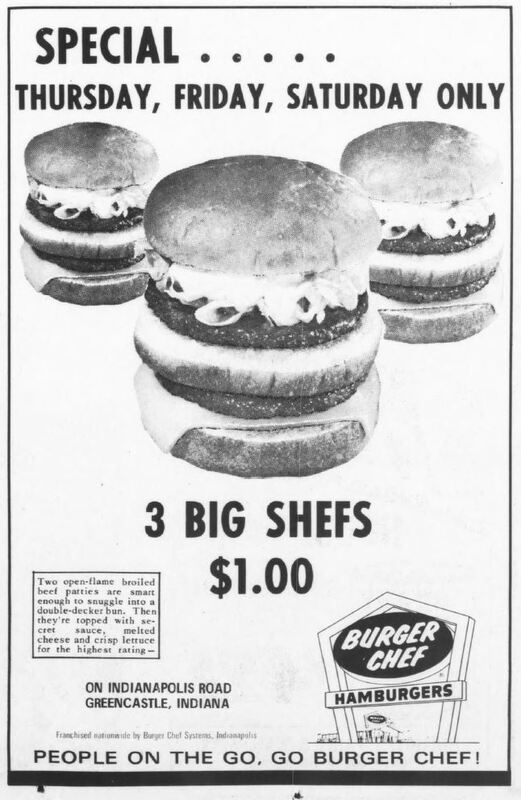 A quick search on Hoosier State Chronicles, however, turned up nothing about the history of my own lunch — pierogis — so here are some food ads from our latest, fresh-cooked batch of newspapers, among others. Though ours come from Greencastle, that’s about all the “green” you’re going to get. 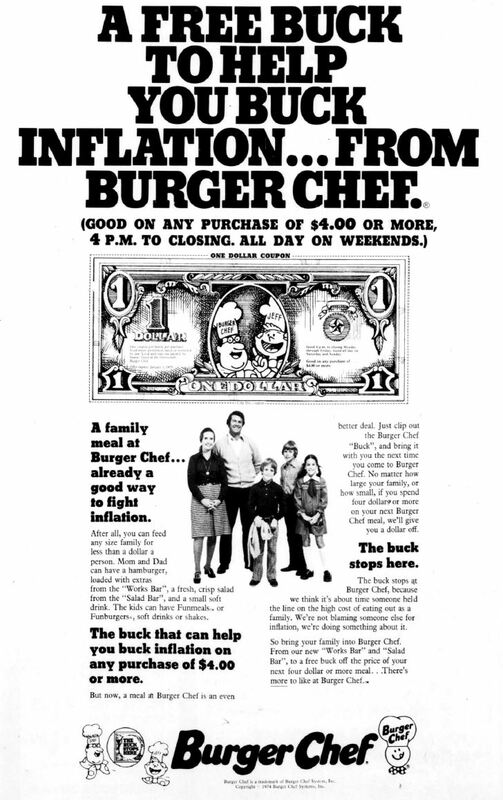 Nostalgic food-lovers might remember Burger Chef. Surpassed only by McDonalds, which only had about a thousand locations itself in 1968, until the late 1970s this was America’s second-biggest food chain. Originally opened in Indianapolis, Burger Chef’s rapid rise came as an unexpected spin-off of the open-flame burger broiler invented for Burger King in the mid-1950s by Hoosier brothers Frank and Donald Thomas. The Thomases worked for Sani-Serv, a Mooresville company that’s still in business and primarily produces soft-serve ice-cream dispensers and milk shake machines. 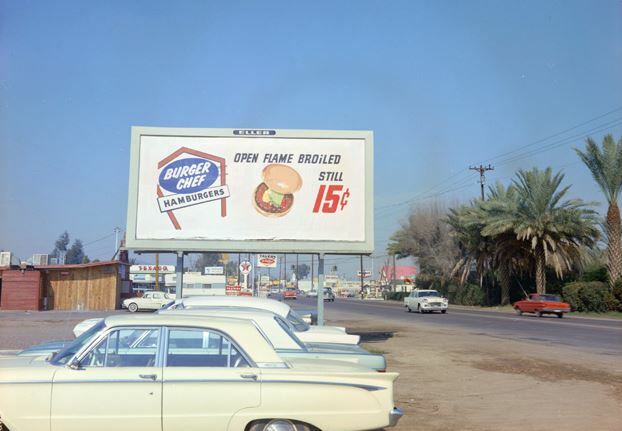 Rather than go to work for Burger King, the broiler’s inventors opened up their own business — first at 1300 West 16th Street, then in franchises that numbered into the thousands by 1968, the year they sold off the company to General Foods, under whose management the burger chain tanked by about 1980. 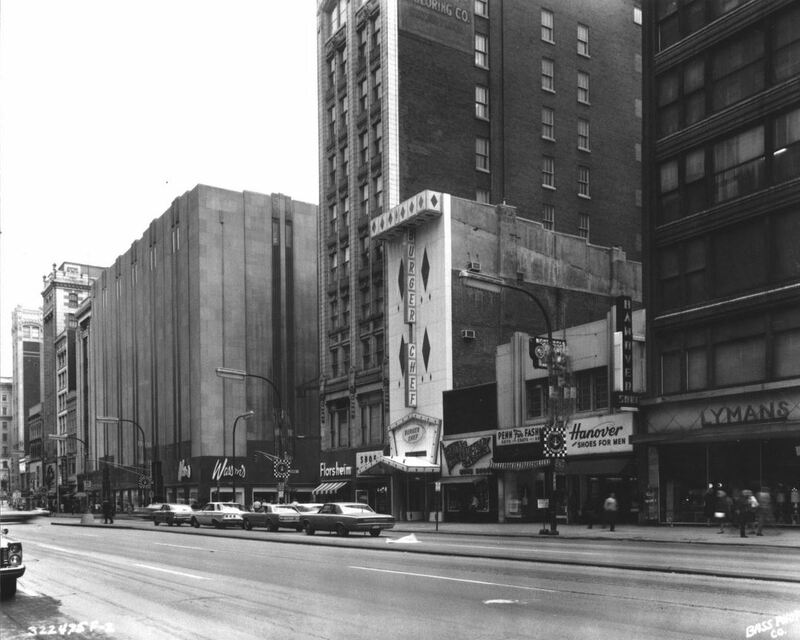 Burger Chef’s 450th store, at 6 East Washington Street in downtown Indianapolis, in 1967. The original building was torn down in 2002. The site is now occupied by a Chipotle, next door to a Jimmy John’s. Bass Photo Collection, Indiana Historical Society. The Thomas brothers’ burger broiler was originally capable of cranking out 1,000 cooked burgers every hour, a number upped to 2,000 by the mid-1960s. Hundreds of pounds of meat rapidly fired over the conveyor belts “reduced tremendously the amount of time it takes you to be served at Burger Chef.” In addition to “quick-as-a-wink” service and pre-ordering by telephone, mass production also drove the price down to just 15 cents a burger, which were reportedly ready just 20 seconds after ordering in 1968. 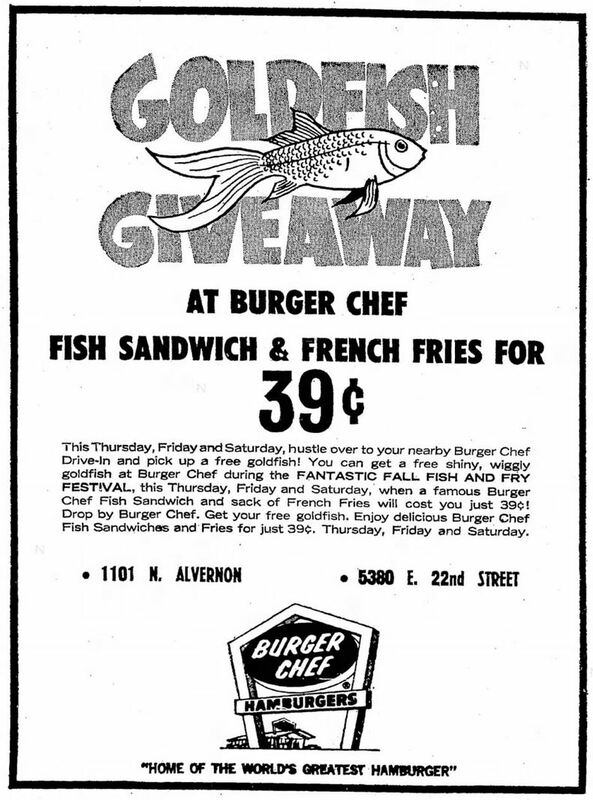 Newspapers in the 1960s spoke of open flame broiling as “sealing in flavor and juices.” Burger Chef also sold “Blue Water boned” hot fish sandwiches for a mere 30 cents. As part of a “modernization campaign,” management added all-you-can-eat salad and fixing bars in the 1970s, which cost them $5,000,000 in central Indiana alone. Apple turnovers came in the mid-60s, and funmeals for kids, which included a toy, in 1973. 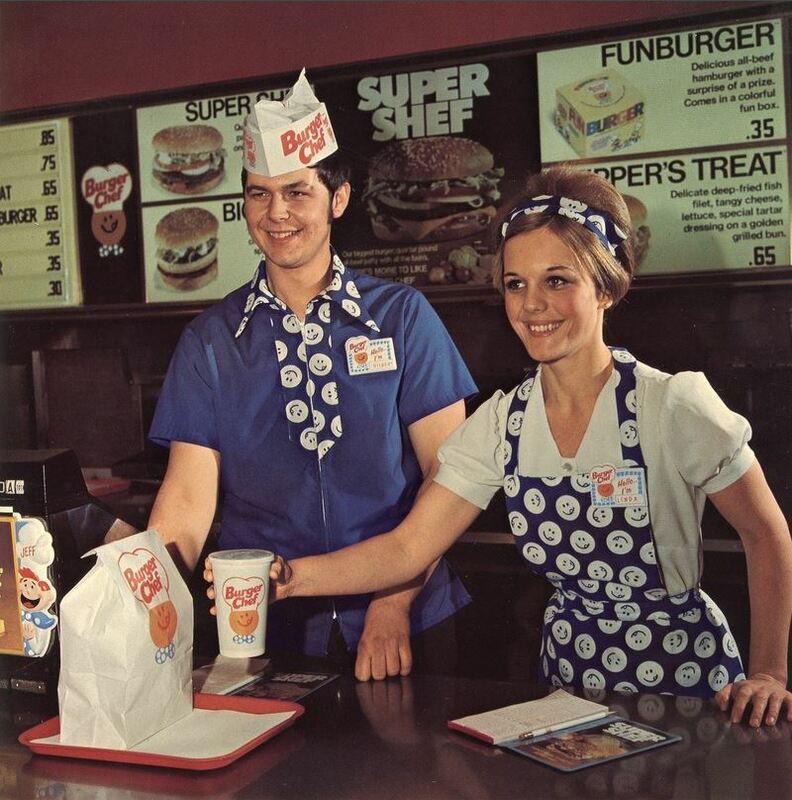 Burger Chef franchises spread to 38 states, but were most popular in the Midwest and Southwest. The Lubbock Avalanche-Journal (Lubbock, TX) reported in 1968 that “all managers have to go through a three-week training school at Indianapolis, Ind., and there is constant research on what kind of food the public wants.” Corporate headquarters were located at 1348 West 16th Street, today a Kirby Risk. Burger Chefs gave away a lot of free stuff — from balloons and suckers to live goldfish and holiday mistletoe. In 1973, Kokomo had a chance to meet actor Burt Ward, who played Robin “the Boy Wonder” across from Batman actor Adam West. (Ward appeared at the Kokomo Mall and a local Burger Chef to sign his autograph on kids’ posters provided by the restaurant.) Family-oriented, both because of its atmosphere and its incredibly cheap prices, the company made itself even more of a bargain by publishing coupons in American newspapers. 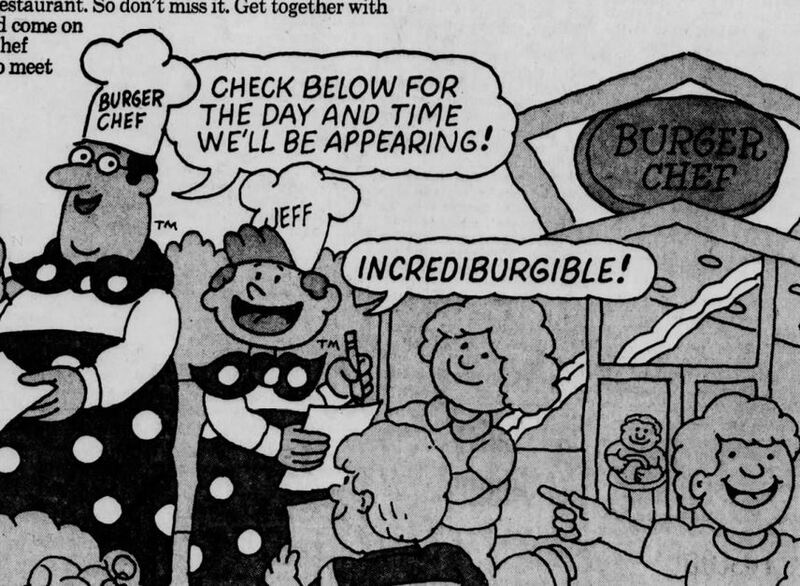 As part of its ad campaign, it also sponsored the popular comic strip Family Circus, as well as an Indianapolis basketball team called simply “Burger Chef” and two Pee Wee football and soccer teams in Kingsport, Tennessee, that went under the same name. Banner Graphic, Greencastle, Indiana, December 12, 1974. Greencastle’s Burger Chef was located at 1047 Indianapolis Road. Low operating costs were due to the fact that most of its nearly 8,000 employees were teenagers in 1968 and worked for low wages. 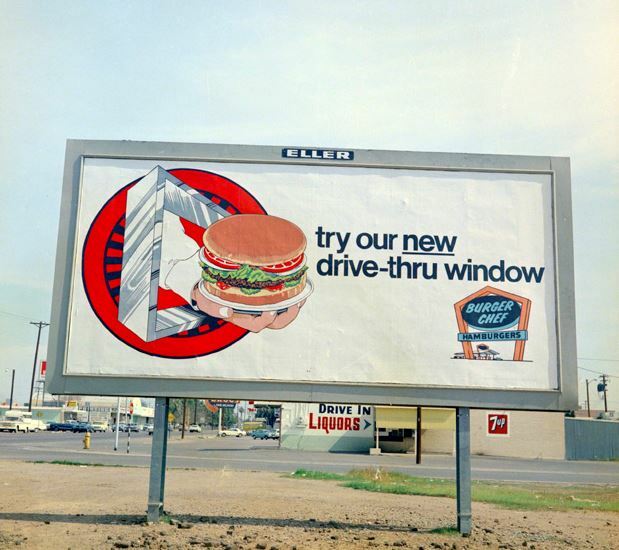 Billboard for an Arizona Burger Chef, late 1960s. Courtesy Duke University Libraries. The last Burger Chef, in Cookeville, Tennessee, closed in 1996. By then, many locations had been converted into fast food joints like Arby’s, Hardee’s, Chinese and Mexican restaurants, and banks. Seventy-two of the locations are documented on Waymarking.com. RoadsideArchitecture.com maintains another page dedicated to these old fast food joints. A renewed spike in interest occurred in 2014, when part of an episode of AMC’s Mad Men was set in a Burger Chef. The scene was shot in a vacant building in Rialto, California, dolled up by the show’s producers. The Mad Men episode prompted Time magazine to do a flashback piece on this restaurant that most Americans would have recognized just a few decades ago. Our arteries are probably glad it’s gone. 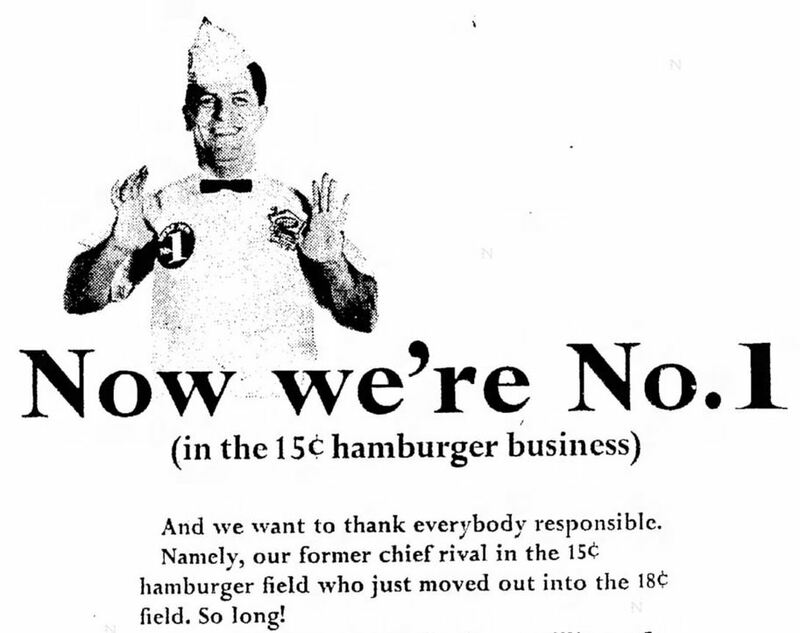 But since Burger Chef had Hoosier roots, our taste buds salute it.